By implementing and maintaining a healthy lifestyle you will feel better, prevent complications of diabetes, improve your level of wellness, and enhance your likelihood of living a long life. Let’s take a look at some of the most important lifestyle activities you can implement. You may need to check your blood sugar several times each day, especially if you need coverage with short-acting types of insulin. Minor illnesses such as colds and gastrointestinal illnesses may cause your blood sugar level to rise. It is important you plan ahead for sick days. Ask your health care provider to recommend over-the-counter remedies that are safe for you to use should minor illnesses occur. Some over-the-counter remedies interact with diabetes medications; others contain sugar. Read product labels carefully. Take a multivitamin/multimineral supplement daily to help prevent minor illnesses from occurring. Extra vitamin C can be helpful for fighting infections. See an ophthalmologist annually. Changes in your eyes can be identified by your eye doctor prior to symptoms being apparent to you. Early identification and treatment of eye disease can preserve your vision. Keeping your blood pressure and blood sugar within normal limits helps to preserve the health of your eyes, heart, brain, and kidneys. You have a higher than normal risk of developing hypertension if you are diabetic. While smoking harms everyone, it is especially dangerous for you if you have diabetes. Smoking increases blood pressure, harms your blood vessels, and impairs your ability to heal from infections. Smoking destroys health-promoting vitamin C and damages the circulation throughout your entire body. Your kidneys, eyes, heart, and extremities are particularly at risk if you have diabetes and smoke. Check your feet every day. Call your health care provider if you sustain an injury or notice a change in your feet or nails. Carefully dry between your toes after bathing. You are more prone to infections of the nails than other people. If you notice discoloration, flaking or other nail problems, get medical attention promptly. Wear clean socks daily. Invest in high quality, properly-fitted shoes. You may be eligible for shoes to be paid for if they are medically necessary. See a podiatrist regularly if you have foot or nail problems. Drink plenty of water each day. Avoid sugary drinks or beverages containing artificial sweeteners. Take steps to avoid contracting bladder infections. Wear clean well-ventilated underwear daily. Clean yourself carefully after each time you go to the bathroom. If you are prone to bladder infections, consider taking cranberry tablets or eating raw blueberries each day, as both fruits help to prevent infection. Have kidney tests done according to the schedule recommended by your health care provider. Stop avoiding the messages from your healthcare team asking you to come in for your Hba1C (long-term blood glucose check), your eye checks and your foot care appointments. Face the music — things might not be as bad as you think, even after the excesses of the festive season and the specialists will help you get back on track if you’ve lost your way. 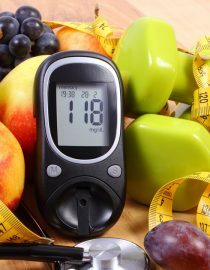 Next page: Seven more healthy tips for living with diabetes. You might also like...What Is Diabetic Ketoacidosis?